Our experienced engineers can supply, install and commission fire extinguishers of all types to suit the needs of your business, adhering to best advice from fire safety risk assessors. As standard, all our extinguishers come with a Unique guarantee for peace of mind, among the best packaged Fire Extinguishers Dorset businesses are offered. The Fire Safety Order 2005 as regulation, permits the responsible person within a business to take reasonable steps to reduce the risk from fire and make sure there are fire protection initiatives in place so people can escape safely in the event of a fire. There’s mention of installing fire extinguishers in the regulation too, and in the event of a fire, using the correct extinguisher is as important as early fire detection with a Business Fire Alarm System. 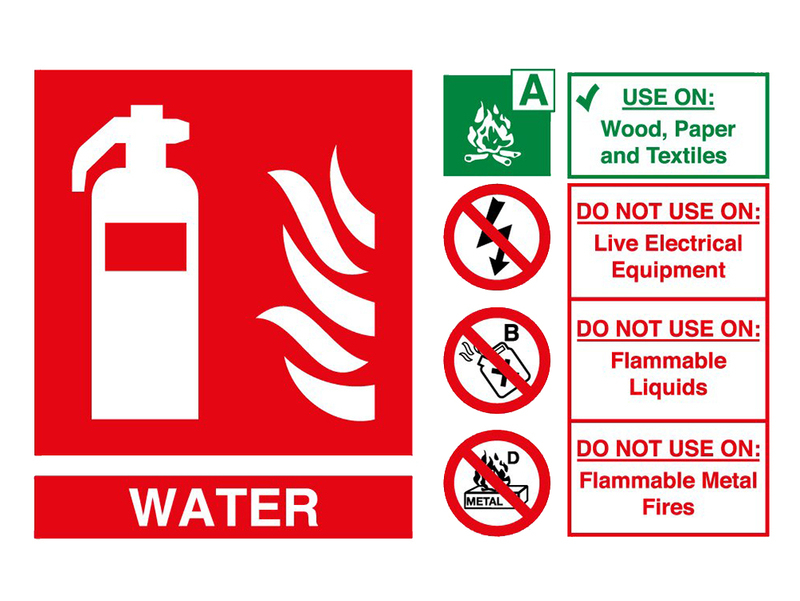 All Unique supplied fire extinguishers are clearly marked and easy to read for the type of fire they should be used on, ensuring that small fires are tackled safely and efficiently. When it comes to early fire protection, fire extinguishers do the job in stopping the spread fires in their early stages. But do you know the different types of fire extinguishers for use on different fires? Using the incorrect fire extinguisher can result in serious injury and risk worsening the fire damage. If in doubt, seek your fire warden as soon as possible but this knowledge of the different types of fire extinguishers can help make a quick decision when needed. For peace of mind, it’s best to have an up-to-date Fire Risk Assessment. 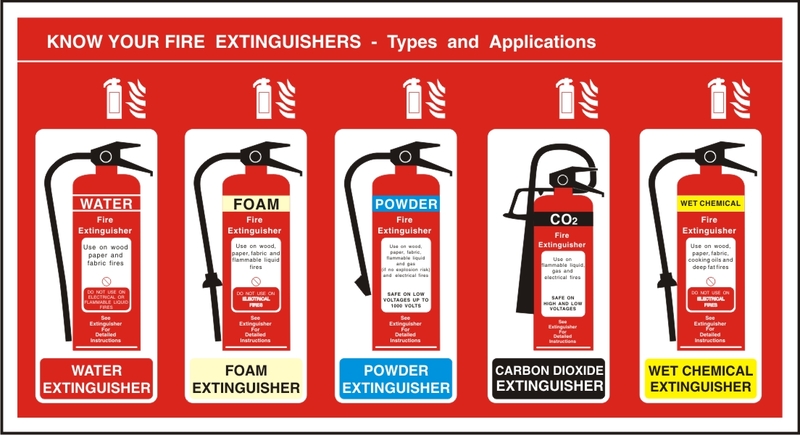 Extinguishers in the UK are colour coded with labels that are visible on the top of them. For your safety, and to pass on this information to anyone uneducated on the subject, take note of the following colour codes. Water fire extinguishers are all red in colour and are used for tackling fires that are burning freely involving paper, wood, textiles and other solid materials, ideal for office, retail shop or warehouse environments. Water fire extinguishers should not be used on electrical fires, as water conducts the electricity, which could cause an electric shock to the user. These types of extinguishers aren’t suitable for fires involving flammable liquids, gases or cooking oil fires in kitchen environments. 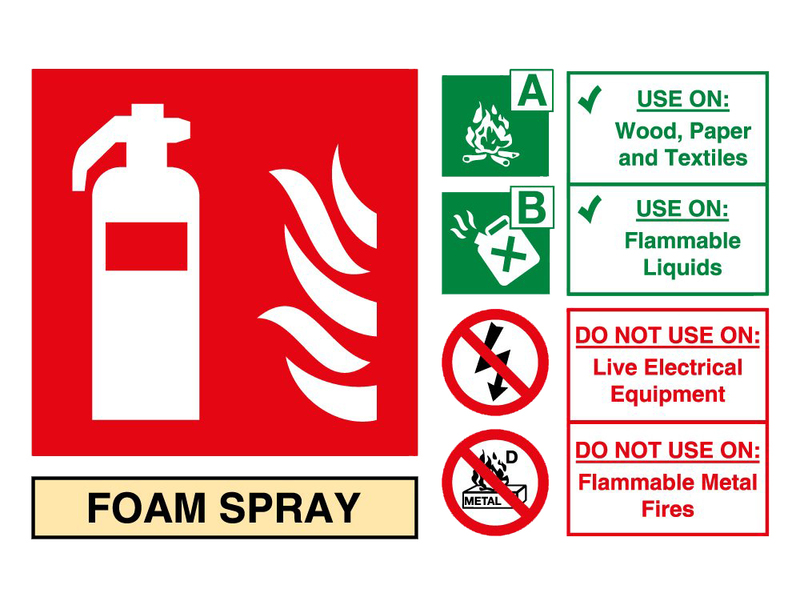 Foam fire extinguishers are also suitable for different types of fires and are recommended for use particularly in factories, petrol stations and hotels. The foam produced is used to smother the fire and starve it of oxygen, thus extinguishing the flames. These are ideal for use on wood, paper, textiles and liquid fires. Although they are safe to use on electrical equipment it will cause considerable irreversible damage to the appliances. They are also unsuitable for use on flammable gases and cooking fires with oil and grease in the kitchen. Powder fire extinguishers can have a wide array of uses and are arguably the most versatile out of all of them. 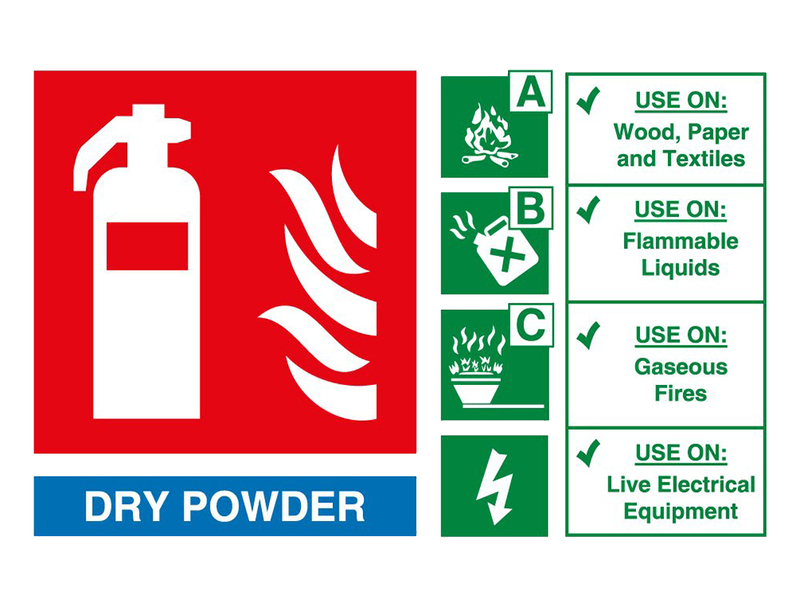 User powder extinguishers on wood, paper, textiles, liquid and electrical fires, so are useful in chemical fires and also vehicles. The powder inside the extinguisher halts the chemical reactions in fires that would otherwise spread, with that being said, it’s not for small spaces like water would be as inhaling the powder is dangerous. 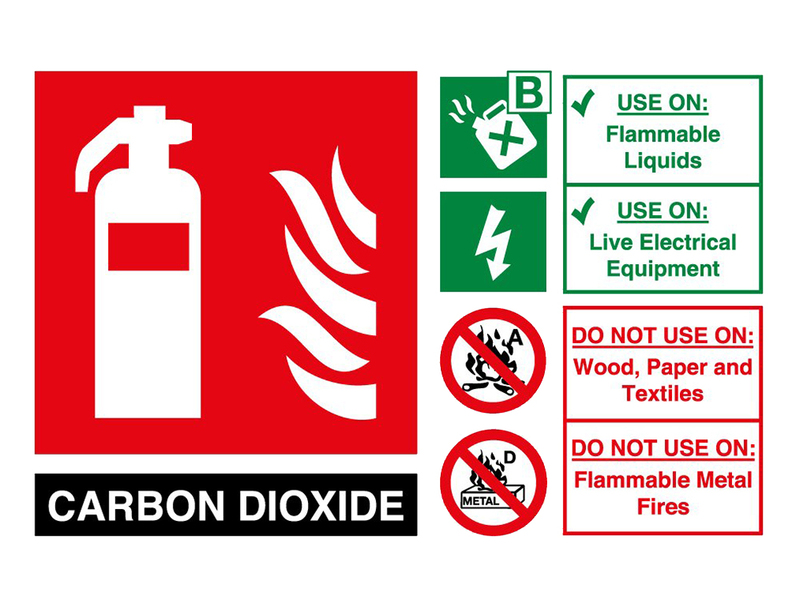 Carbon Dioxide (CO2) fire extinguishers come with a high risk associated with the user if operated incorrectly, caution is always recommended. Improper use may result in skin burns from long contact with the horn of the extinguisher, so avoid holding by this point. Naturally, they also reduce the oxygen supply within a room, which helps starve the fire but will make it difficult to breathe in smaller rooms. CO2 fire extinguishers are effective on electrical fires and flammable liquids including petrol, although ineffective against fires involving wood, paper, textiles, gases and cooking fires within a kitchen. They are best recommended for use in offices, shops, schools and other indoor environments, where there is electrical equipment present. 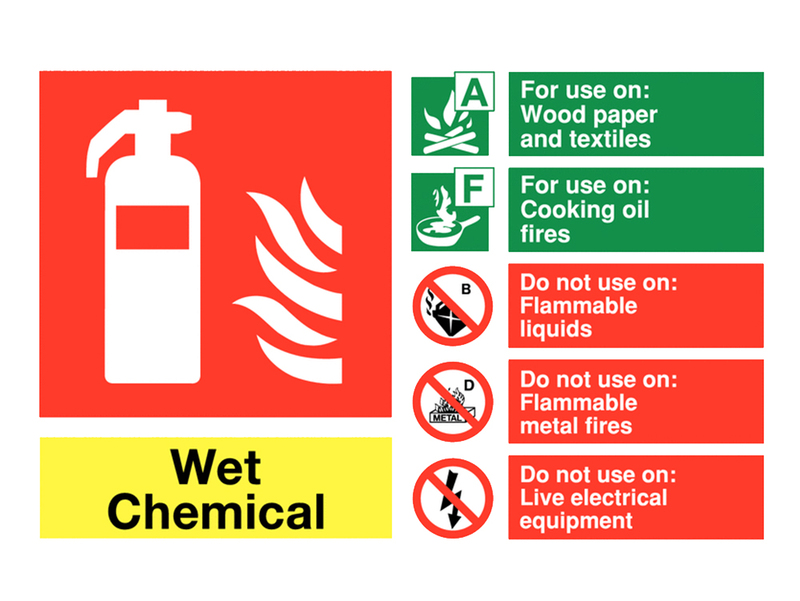 Wet Chemical fire extinguishers are also potentially dangerous to the user’s safety, as they can produce toxic fumes which can linger for a while, even after the fire has been put out. After usage indoors, open windows and doors if possible to make sure the area is well ventilated. The chemical spray released by the extinguisher works by starting a chemical reaction that combines the discharge with the cooking fat or oil, to form a cake of soap like emulsion which cools the fire. These extinguishers are probably the type best suited to fires in the kitchen and are essential for restaurants. They are also suitable for fighting fires involving wood, paper and textiles although not suited for use on flammable liquids, gases and metals. Annual fire extinguisher servicing and maintenance is essential as required by the new fire safety order. The British Standard Code of Practice BS 5306 Part 3 states that fire extinguisher servicing needs to be carried out every year (at the very least) to ensure that the extinguishers are safe and will always function in an emergency. Fire extinguishers Dorset businesses need, can provide many years of reliable fire protection in the workplace but despite the reliability, an annual service by an accredited engineer is still required. Our engineers can visit on a regular basis to ensure your equipment is kept ready for the moment when you really need it and would be happy to advise on any of your other fire safety queries you may have. Click through to Fire Extinguisher Maintenance for more info on servicing and repairs.